It's not in America's national security interest to have a Defense Secretary who regularly receives praise from an organization named an unindicted co-conspirator to fund the terrorist group Hamas in America's largest terrorism financing case; an organization officially banned from cooperation with the FBI and cited as an agent of the Muslim Brotherhood in America. 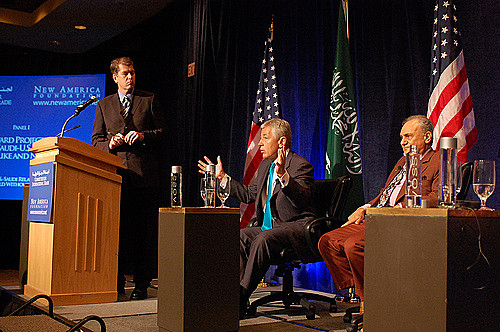 Leading Obama Secretary of Defense candidate Chuck Hagel (center), advocating for closer U.S.-Saudi Arabia ties at a 2009 New America Foundation conference on U.S.-Saudi ties. The New America Foundation is known as a far-left, anti-Israel organization funded by George Soros. A lot has been written in the past few days about leading Obama Secretary of Defense candidate Chuck Hagel's virulent anti-Israel views and pro-Iran inclinations. He's even voiced conspiratorial theories about Jews controlling American foreign policy. But what do Islamists themselves say about Hagel? In 2006, the Iranian-backed terrorist group Hezbollah fired countless rockets from Lebanon into Israel, then attacked an Israeli patrol on the Israeli side of the Israel-Lebanon border. Three soldiers were killed and two others taken hostage. Five more Israelis were killed in a failed rescue attempt. As Israel Defense Forces attempted to stop the rocket fire, search for its missing soldiers and remove the Hezbollah threat, then Senator Hagel demanded an immediate cease-fire. This won praise from CAIR Executive Director Nihad Awad (see above), who once said "I am a supporter of the Hamas movement." The above was reported by the National Jewish Democratic Council (NJDC) on their website on March 12, 2007. The posting has since been deleted, but a cached version can be seen here.